CLICK HERE FOR COMPLETE STATEMENT! 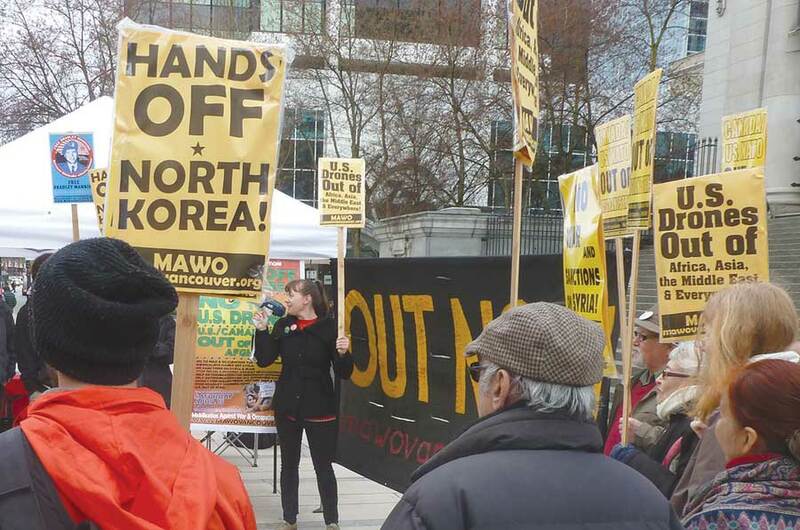 U.S./Canada Hands Off North Korea! 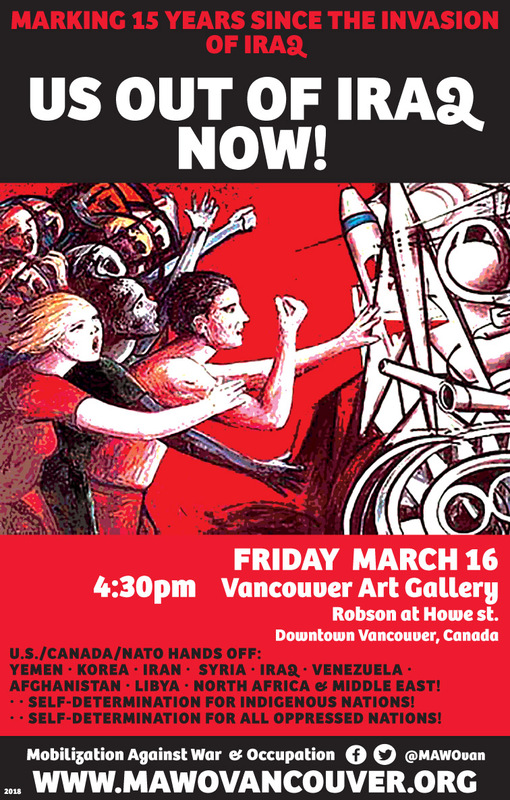 Stop the United Nations Security Council War on North Korea! 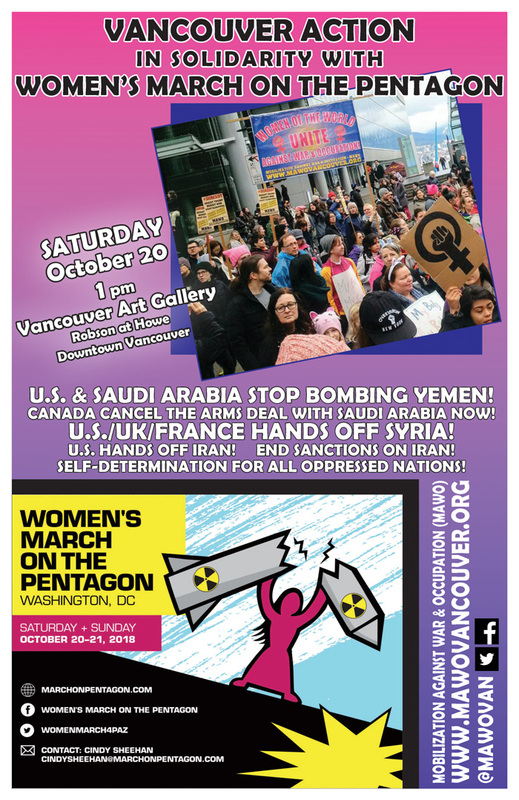 Canada Cancel the Arms Deal with Saudi Arabia! 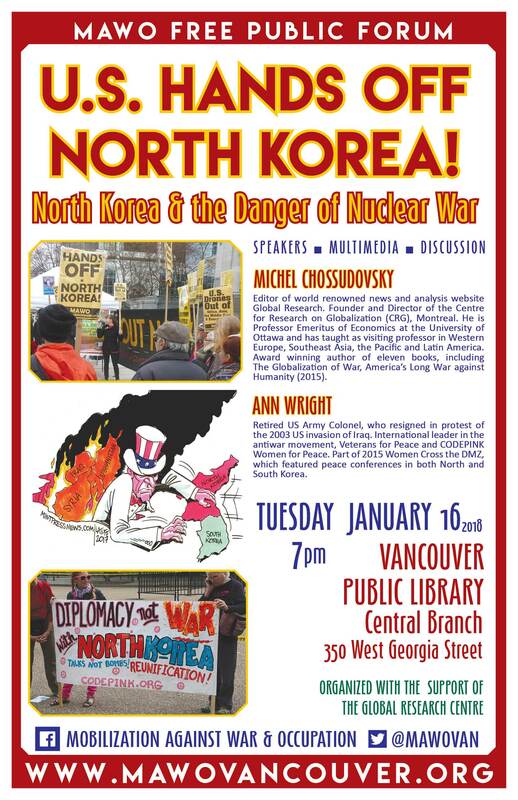 Iraq, Iran & North Korea! 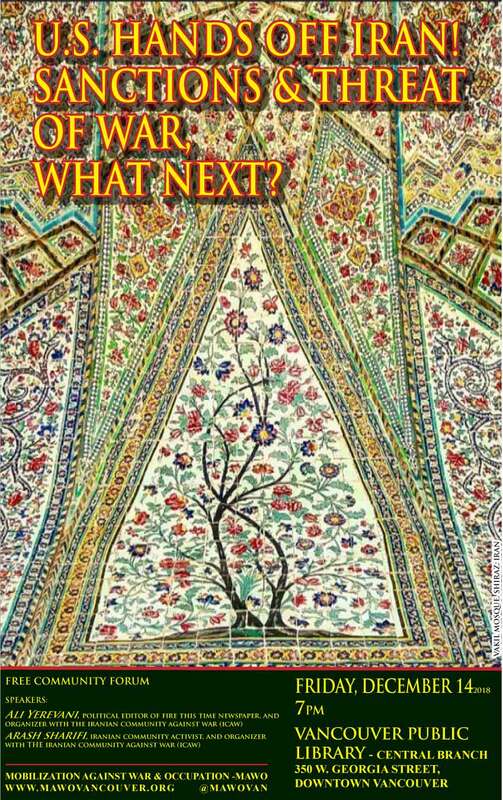 Sanctions & Threats of War, What Next? 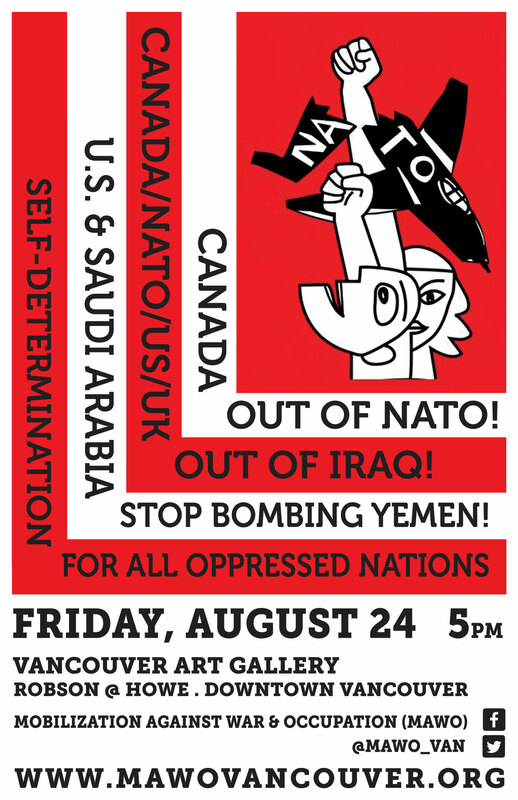 Stop Saudi Aggression & Killings! 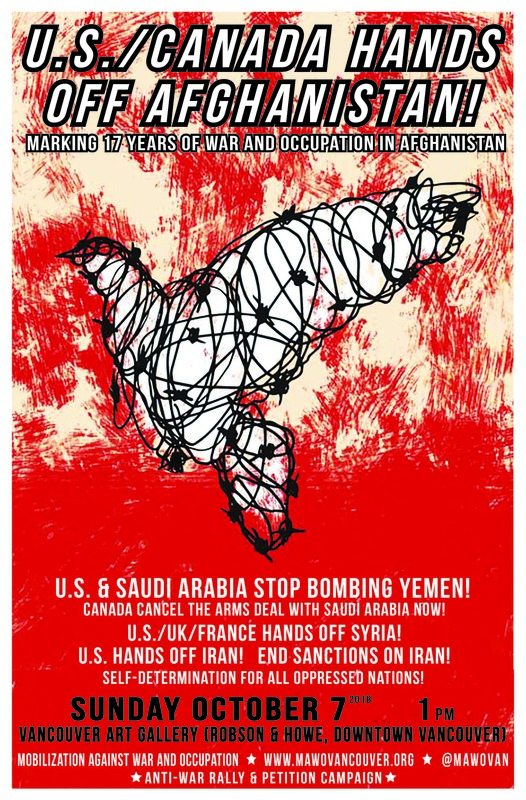 US & Saudi Arabia Stop Bombing Yemen! 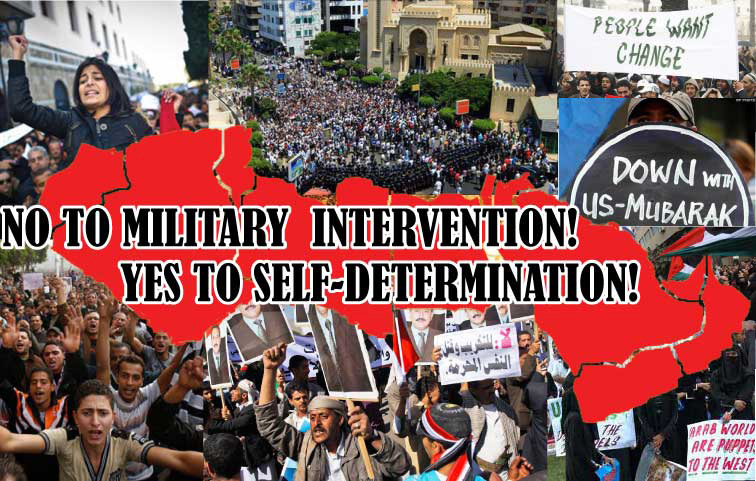 Self-Determination For All Oppressed Nations! 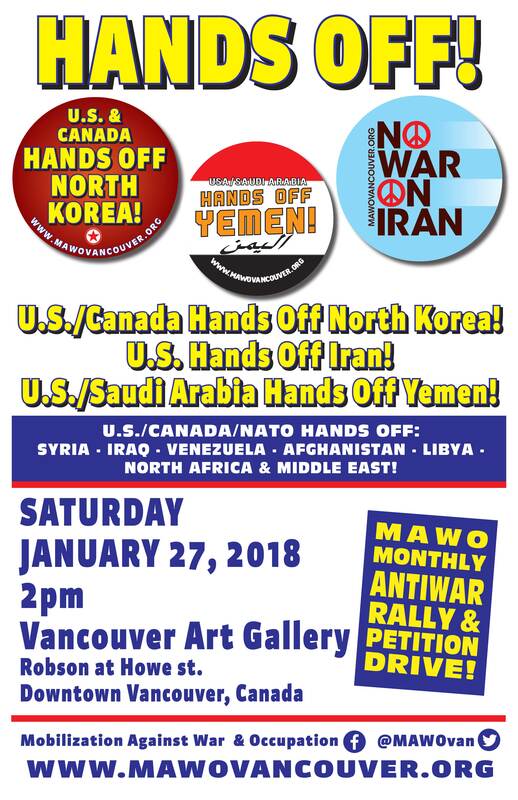 US/UK/France/Canada/NATO Hands Off the Middle East! 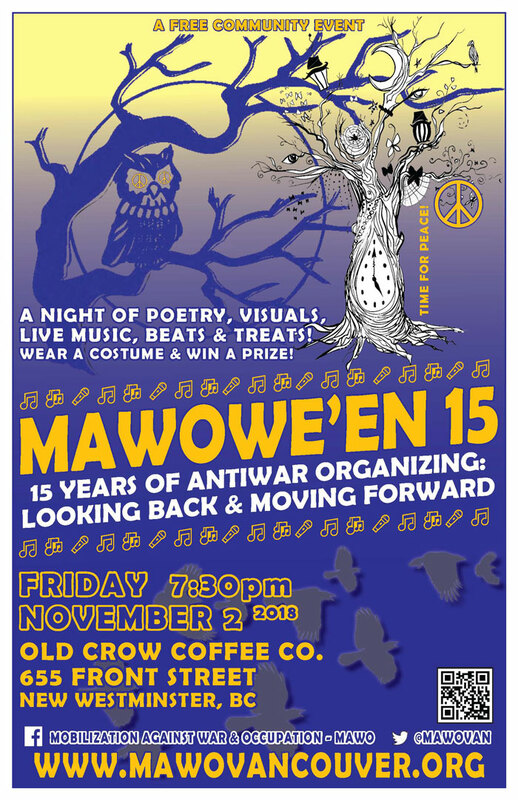 No to War and Occupation in the Middle East! 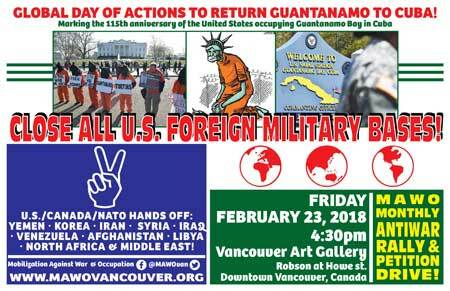 Part of the International Days of Antiwar "Spring Action"
Global Day of Actions to Return Guantanamo to Cuba! 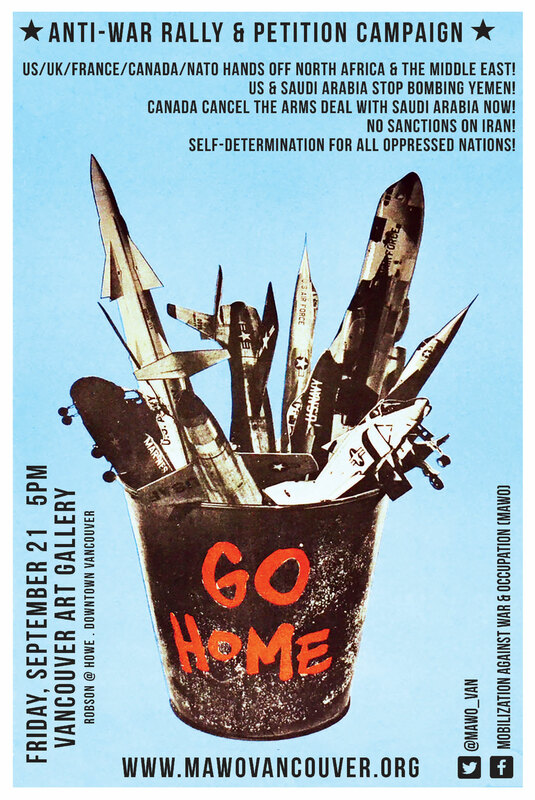 Close All U.S. Foreign Military Bases! 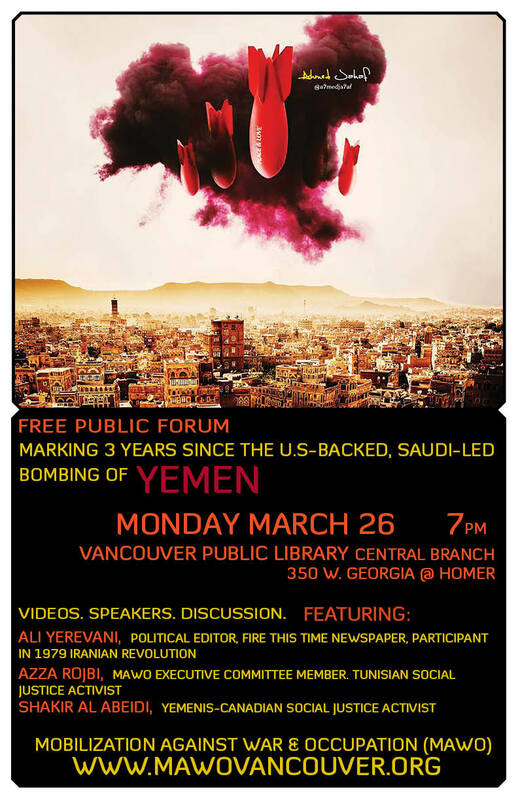 U.S./Saudi Arabia Hands Off Yemen! Click Here for Event Reports from 2017,2016, 2015, 2014, 2013, 2012, 2011, 2010, 2009, 2008, 2007, 2006, 2005, 2004 and 2003! 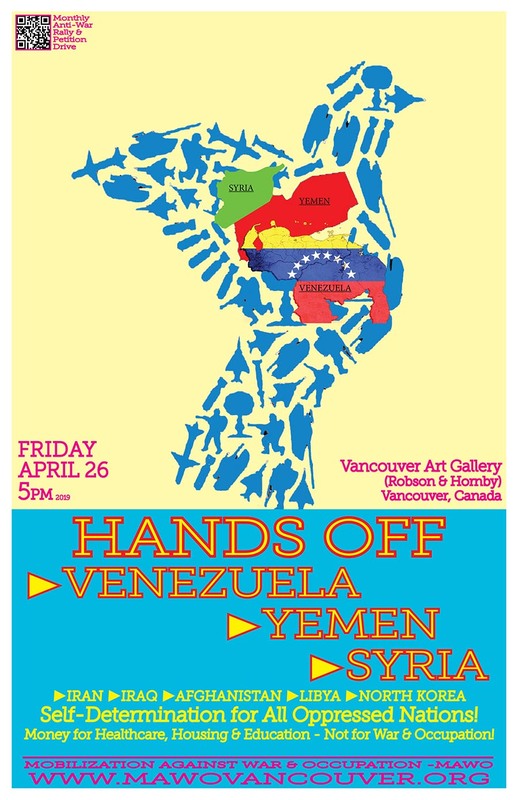 Hands Off Venezuela, Yemen and Syria! 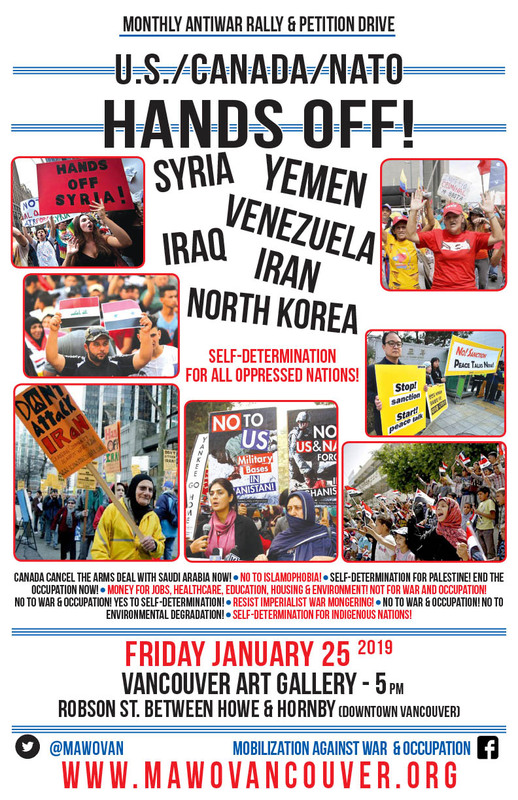 Great show of solidarity at "U.S Hands Off Iraq" protest! 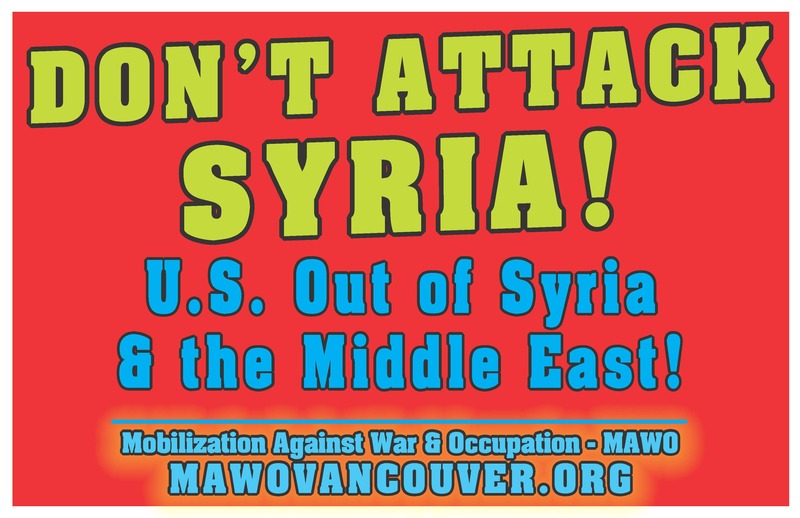 On Sunday May 10, 2015 MAWO co-organized with the Iraqi and Muslim community in Vancouver a protest rally against the United States intervention and meddling in Iraq, demanding "US Out of Iraq". 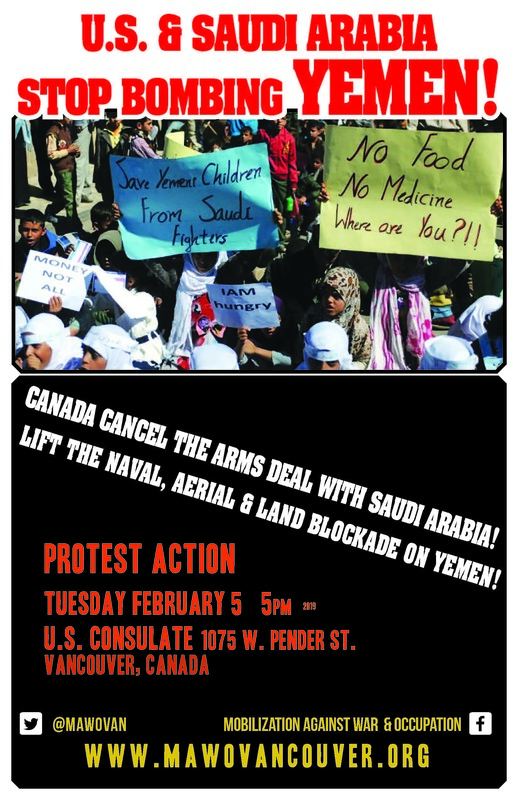 The protest rally took place in front of the US consulate in Vancouver. 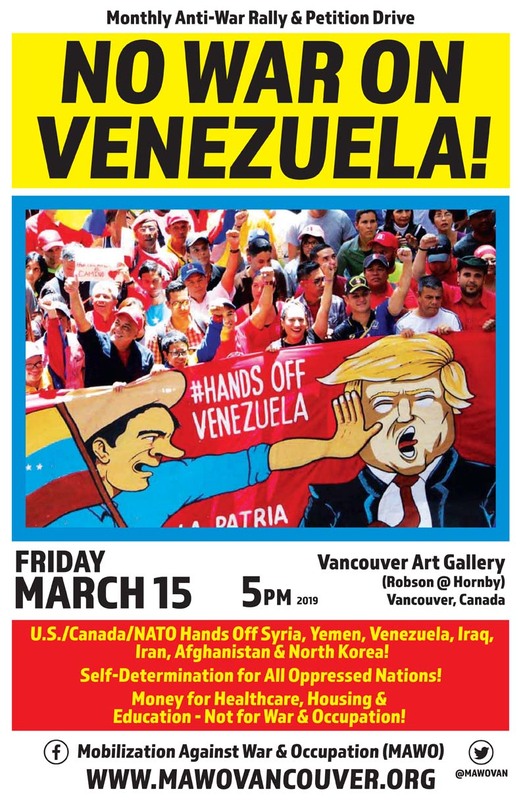 The protest was observed by hundreds of pedestrians who were walking to and from the waterfront area and many of them either stopped, picked up fliers and brochures or joined the protest. 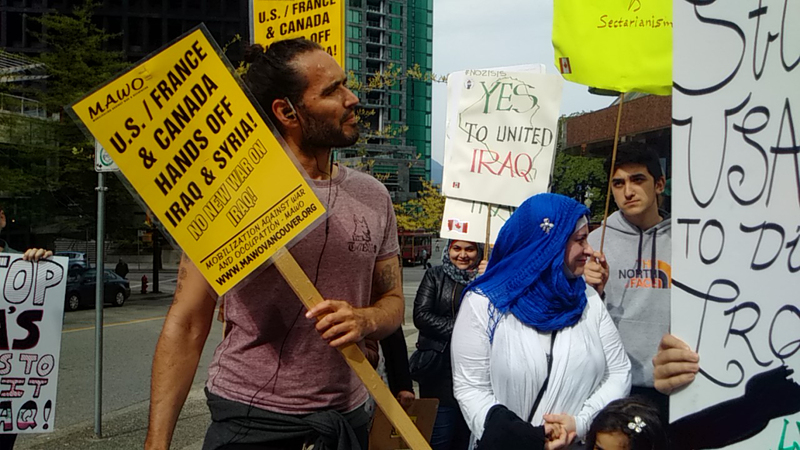 We also had a surprise guest, world renown British comedian and social justice activist Russell Brand stopped by, spent some time with protesters and also shared some supportive words in solidarity with the Iraqi people and against US intervention in Iraq! CLICK HERE FOR MORE PICTURES FROM THE PROTEST! For one month Saudi Arabia, with the backing of the US, has devastated Yemen with a brutal and criminal bombing campaign. 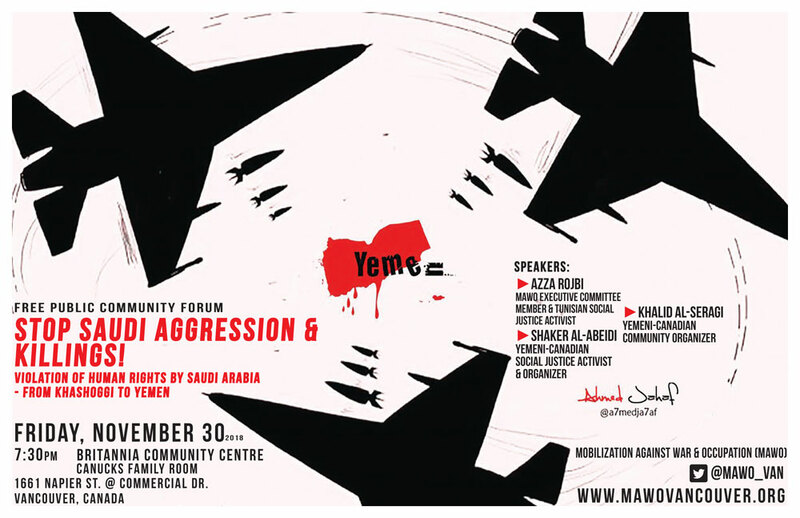 According to UN estimates, over 1,100 innocent Yemeni people have been killed. UNICEF last week released a report that by conservative estimates, more than 115 children have been killed by the Saudi-led war on Yemen. The indiscriminate bombing campaign against Yemen has created a humanitarian crisis where basic infrastructure has been destroyed, over 150,000 people have been displaced from their homes, and 12 million people in Yemen do not know where there next meal is coming from. it is the New Imperialist War Drive in the Middle East! 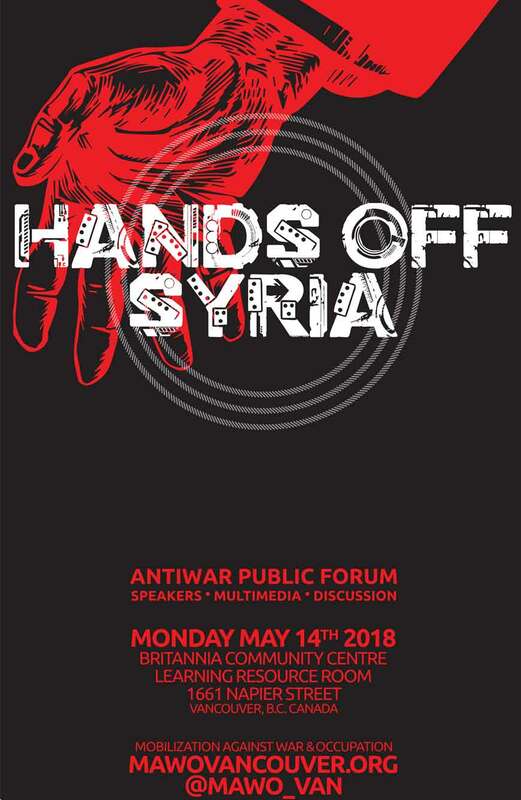 For almost four years the United States and other imperialist governments have been actively engaged ina bloody campaign to overthrow the government of Syria. They have been limited so far to imposing a cruel civil war upon the country by pumping it full of anti-government mercenaries. Throughout this entire time they have been constantly searching for an excuse to justify a full scale military intervention. 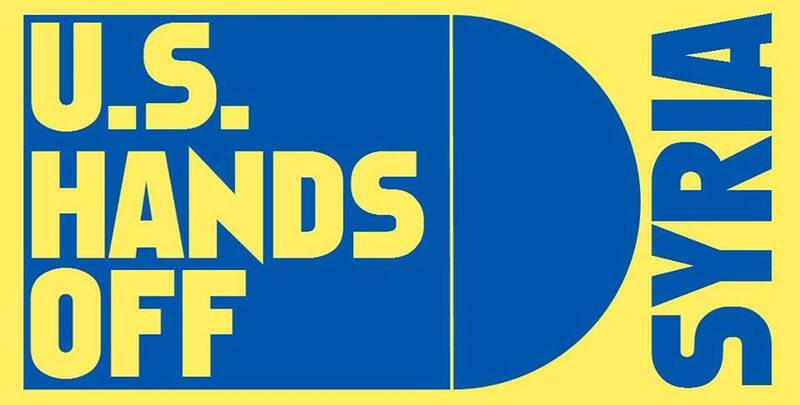 Now they think they finally have one in a so called â€œthe war against ISIS/ISILâ€�. 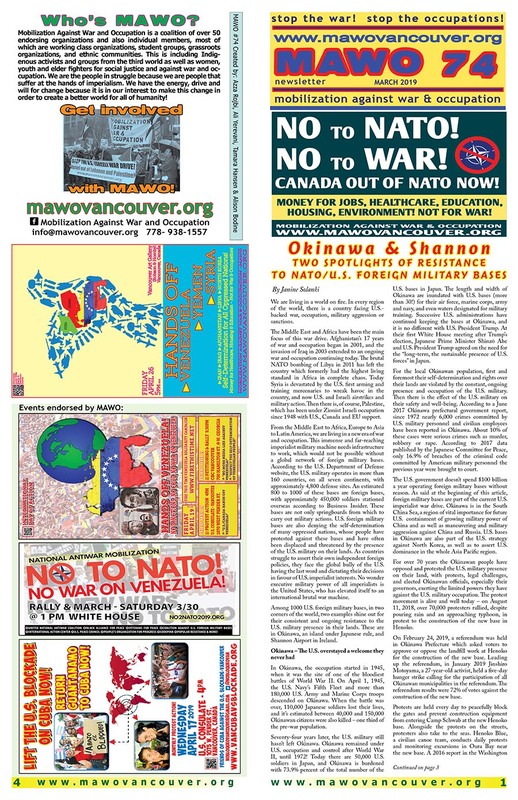 NO TO ANOTHER U.S. WAR IN IRAQ! 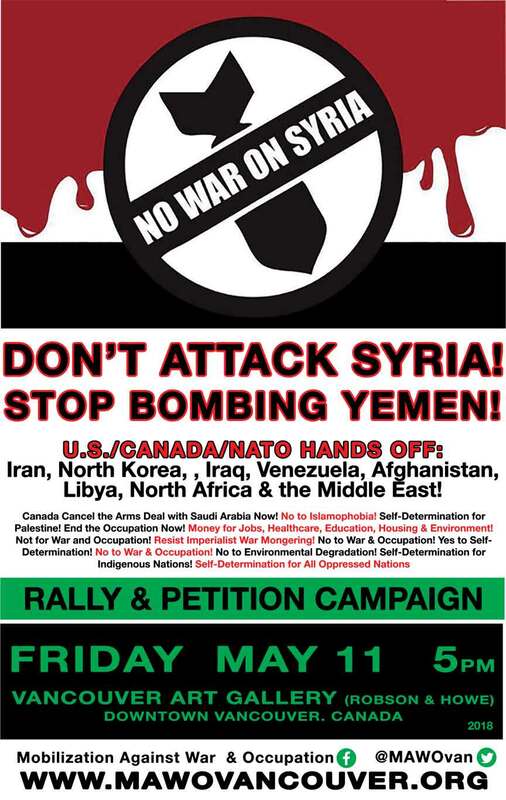 CANADA HANDS OFF IRAQ AND SYRIA! NO TO ALL FORMS OF TERRORISM! 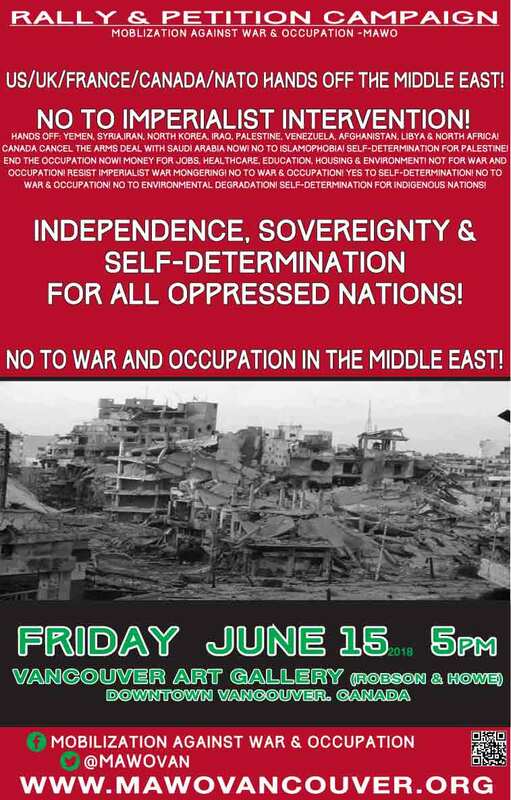 Since the beginning of June 2014, the open wounds of Iraq caused by sanctions, wars and occupations have grown deeper. This is when the Islamic State in Iraq and al-Sham (ISIS, also known as ISIL) began an onslaught against Iraq, establishing control of important border crossings, cities and territories in Iraq through terrorist actions directed against Iraqi civilians. As of June 29, ISIS had taken control of Iraq's second largest city, Mosul, and declared a â€œCaliphateâ€� state in the areas under their control in Northern Iraq in opposition to the Iraqi state. Fighting between ISIS and the Iraqi military forces continues, imposing more violence and destruction on the people of Iraq who are already facing the daily reality of a country devastated by over 11 years of U.S.-led war and occupation. In response to the ISIS terrorist attacks, the U.S. government has sent 770 troops (with the possibility of many thousands more to be sent) into Iraq. 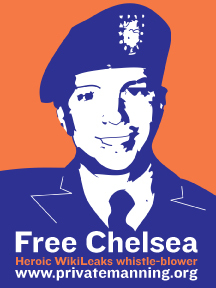 The majority of them, 470, are charged with security of the gigantic U.S. Embassy in Baghdad. 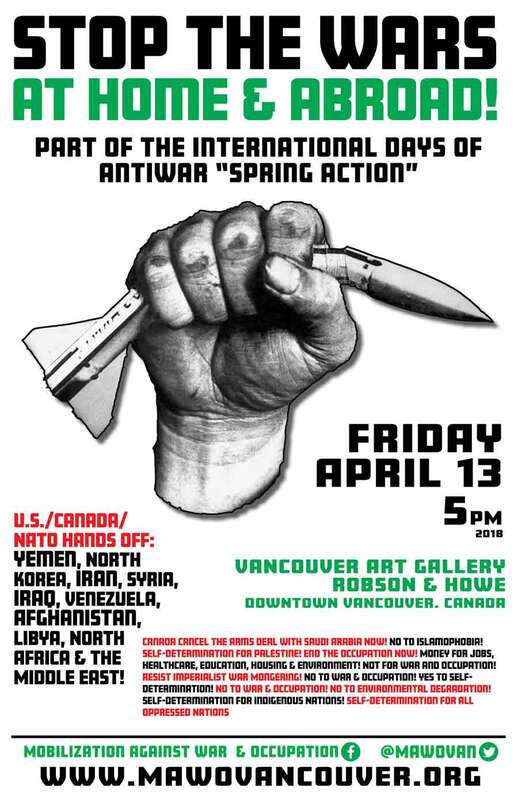 Find out about upcoming antiwar events & actions! 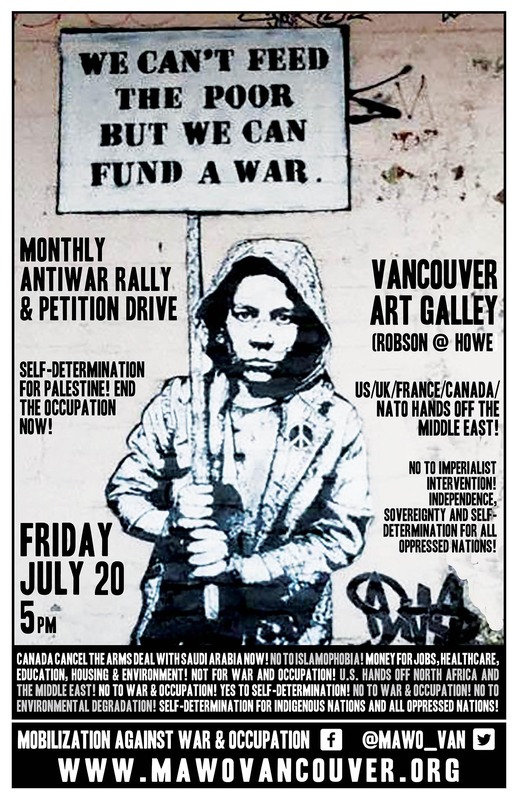 Mobilization Against War and Occupation is a coalition of over 75 endorsing members, most of which are labour unions, student unions, Indigenous groups, Women's Organizations, and groups from the third world. 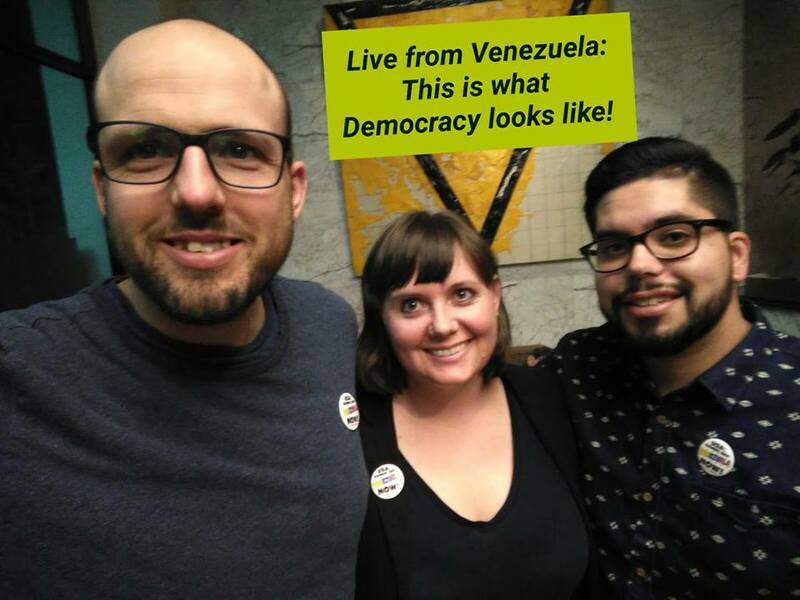 We are the people in struggle because we are people that suffer at the hands of imperialism, we have the energy and drive for change, and it is in our interest to make this change!